A man who has once looked with the archaeological eye will never see quite normally. He will be wounded by what other men call trifles. It is possible to refine the sense of time until an old shoe in the bunch grass or a pile of nineteenth century beer bottles in an abandoned mining town tolls in one’s head like a hall clock. The Night Country (1971), 81. 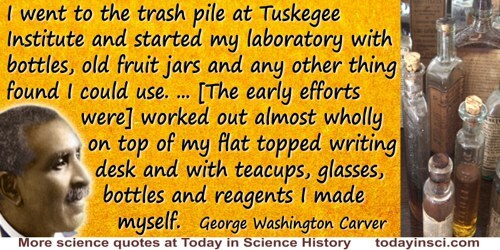 I went to the trash pile at Tuskegee Institute and started my laboratory with bottles, old fruit jars and any other thing I found I could use. ... [The early efforts were] worked out almost wholly on top of my flat topped writing desk and with teacups, glasses, bottles and reagents I made myself. Manuscript fragment, no date, Box 1, George Washington Carver Papers. Cited in Linda O. McMurry, George Washington Carver, Scientist and Symbol (1982), 130. It is a custom often practiced by seafaring people to throw a bottle overboard, with a paper, stating the time and place at which it is done. In the absence of other information as to currents, that afforded by these mute little navigators is of great value. In The Physical Geography of the Sea (1855), 28. It is with narrow-souled people as with narrow-necked bottles, the less they have in them, the more noise they make in pouring out. Man cannot live by milk alone. Love is an emotion that does not need to be bottle- or spoon-fed. From Presidential Address (31 Aug 1958), 66th Annual Convention of the American Psychological Association, Washington, D.C., published in In 'The Nature of Love', American Psychologist, 13, 673-685. The attempted synthesis of paleontology and genetics, an essential part of the present study, may be particularly surprising and possibly hazardous. Not long ago, paleontologists felt that a geneticist was a person who shut himself in a room, pulled down the shades, watched small flies disporting themselves in milk bottles, and thought that he was studying nature. A pursuit so removed from the realities of life, they said, had no significance for the true biologist. On the other hand, the geneticists said that paleontology had no further contributions to make to biology, that its only point had been the completed demonstration of the truth of evolution, and that it was a subject too purely descriptive to merit the name 'science'. The paleontologist, they believed, is like a man who undertakes to study the principles of the internal combustion engine by standing on a street corner and watching the motor cars whiz by. Tempo and Mode in Evolution (1944), 1. We must view young people not as empty bottles to be filled, but as candles to be lit. Quoted, without citation, in Robert Grover, Collaboration (1996).